Chiefly highlighting the developments across the global automated infrastructure management (AIM) solutions market, Silver Tree Consulting & Services, in its recent announcement has revealed that it will be leveraging the Apptinuum, a platform developed by ChoiceWORX, to provide AI-fueled services. This platform, is deemed to be one-of-its-kind combining multiple modern technologies to fuel infrastructure management, device support, Mean Time To Repair (MTTR), end-user application and ultimately customer experience. Such instances of large scale enterprises shifting their focus toward enhancing their operational efficiency by minimizing the number of manual tasks is certain to impel the growth of the AIM solutions market, which according to estimates was valued at USD 1.5 billion in 2017. According to the reports, the increasing demand for automating the data storage and documentation work at commercial buildings, central offices, and data centers has considerably driven the adoption of AIM solutions. By deploying such tools, network administrators and enterprises are said to be able to effectively streamline work, monitor network connectivity & physical connections, gain a precise overview of overall connectivity information, produce up-to-date reports on the state of the infrastructure, and reduce downtime by real-time monitoring and notifications. Given such advantages, several companies that are dealing with manual data management issues and human errors, are adopting AIM solutions to improve end-user support, in turn propelling the competitive landscape of automated infrastructure management solutions market. The competitive spectrum of AIM solutions industry comprises numerous top-notch firms including IBM Corporation, Fujitsu Ltd., METZ Connect, CommScope, Inc., CA Technologies, The Siemon Company, and PagerDuty to name a few. These companies are targeting their innovative solutions to the customers across myriad countries in turn expanding their global reach and overall stance. Beyond the core players, the colossal investments by the tech magnates including Google, Microsoft, Apple, and Facebook for building huge size data centers and storing massive industrial data is expected to demonstrate unprecedented growth in AIM solutions industry share. Recently in June 2016, Microsoft Corporation announced its plan to launch two new data centers in Canada, while Google in August 2018, has announced to develop its third data center in Singapore. A slew of such large-scale project deployment is expected to take the commercialization potential of the global AIM market several notches up in the ensuing years. Further taking into account the vast geographical expanse of this business sphere, it is prudent to mention that North America so far is proving lucrative investment opportunities, accounting for over 40% of the global automated infrastructure management solutions industry share in 2017. The rapid product deployment trends in the U.S. and Canada have been identified as the pivotal factors behind the region’s dominance. The robust digitalization trends, launch of new data centers, and early adoption of cloud computing, IoT, AI, along with the presence of renowned tech & IT giants in the region, will assist in rapid product demand, thereby impelling the AIM solutions market expansion. Being one of the most pivotal verticals of the electronics & media industry, automated infrastructure solution market has undeniably gained massive prominence in the recent years. The further on-going development in the IT infrastructure to support the modern-day technology and digitization, high quality management and control on the process will be nothing but essential for business expansion. With the everyday changing technology and rising need to support and manage the processes, the global AIM solutions industry is certain to carve a lucrative roadmap in the years ahead. 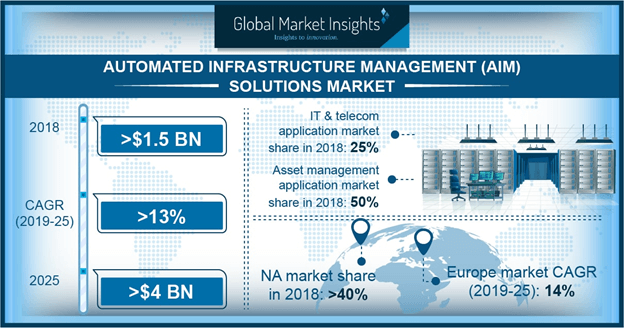 A presumption validating the same is of Global Market Insights, Inc., that claims automated infrastructure management solutions market to surpass valuation of over USD 3.5 billion by 2024.